So I stumbled over this issue of Black Belt Mag from April 1968. Therein appeared an interview with three young men from Okinawa, plannning to stay in the US for maybe four years and maybe open a dojo: Kina Santos, Taba Kensai, and Iha Seikichi. All of these are well-know, seasoned, and highly respected masters today. That is not quite correct. In the Okinawa Karatedo Renmei there were the four styles of Shorin-ryu (headed by Higa Yuchoku), Matsubayashi-ryu (headed by Nagamine Shoshin), Goju-ryu (headed by Yagi Meitoku), and Uechi-ryu (headed by Uechi Kan’ei). The association president was Chibana Shoshin. Kina obviously wasn’t even aware of the distinction between Shorin and Matsubayashi. Four years earlier, Taira Shinken noted, that “On Okinawa, the cradle of Karatedo, there are currently the style of Shorin-ryu, Matsubayashi-ryu, Goju-ryu, Uechi-ryu und Isshin-ryu.“ Except Matsubayashi-ryu, the other schools he included under the umbrella term of Shorin-ryu here were all the schools of all of the following persons: Chibana Choshin, Higa Yuchoku, Nakazato Shugoro, Miyahira Katsuya, Shimabukuro Eizo, Nakamura Shigeru, an Soken Hohan. These were, and I’d say correctly for that time (1964), explicitly descibed as as Shorin-ryu (小林流, alternativaley Kobayashi-ryu). There is no doubt that these were the official names at the time (1964). I also think that Miyzato would have disagreed that Goju is led by Yagi, but ok.
Of course, this refers to nothing but the Shorin-ryu Karate-do Kyokai 小林流空手協 of Chibana Shōshin. BB: “Do you have many tournaments during the year? Kina: “No, just one major tournament, the Okinawa Karate Kobudo Rengokai which draws more than 20,000 spectators. Actually, this was the Zen Okinawa Karatedo Renmei (established in February 1967), first president was Nagamine Shoshin. It was the successor of the Okinawa Karatedo Renmei, established in May 1956, with president Chibana Choshin, and vice-president Nagamine Shoshin, the latter who also became successor of Chibana as president in 1960, when Chibana was already 75 years of age. Black Belt asks if this “tournament” has any other functions? So they all graded there for the higher dan grades. All the main and “other” styles graded up to 4th dan within their groups, and for 5th dan and up all members of these styles had to grade with the Zen Okinawa Karatedo Renmei, with president Nagamine, and hosted and presided over by the Zen Okinawa Karate Kobudo Renmei, or so it says, hmm. According to their calculation, it took about 5 years up to Yondan, and then another 5 years up to 5th dan, i.e. a total of 10 years. It is still like this in Okinawa. So they were all graded by a board of examiners under what? The whole organization “Nagamine at the same time was the director” of?!?! Or the Zen Okinawa Karate Kobudo Renmei ??? Chibana Choshin had a dojo in Naha, Meitoku Yagi had a dojo in Naha, Nagamine had a dojo in Naha…. What the heck is that supposed to mean? Well, whatever this was – a wrong translation, pure mischief by the editor, or youthful flippancy – the only explanation that would make any sense – except for he’d been simply confusing the facts or didn’t know and understand these – is that a young Kina – or the reporter – introduced the current Okinawan Karate politics of the time into the states, isn’t it? BTW, is there anybody who did NOT get caught up in Karate politics yet? 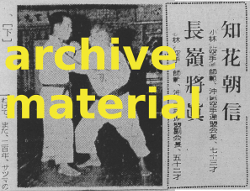 Chibana Choshin (Shorin-ryu, president of Okinawa Karatedo Renmei) and Nagamine Shoshin (Matsubayashi-ryu, vice-president of Okinawa Karatedo Renmei), during Kumite in the 1950s. Some time after writing the above article I came across an explanation for what caused the above jumble about persons etc. It is found in the October 1968 issue of Black Belt Magazin. 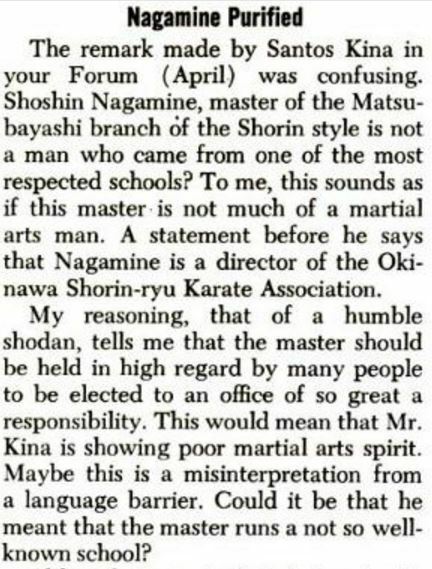 There appears a letter to the editor as regards the picture the article drew of Nagamine Shoshin. 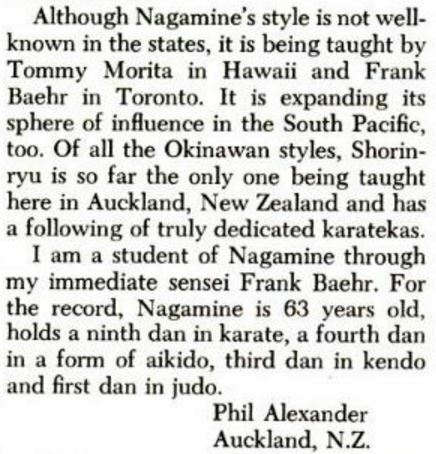 This entry was posted in Book Reviews, Unknown Ryukyu and tagged Chibana Choshin, Nagamine Shoshin, Okinawa Karate, Okinawa Karatedo Renmei. Bookmark the permalink.